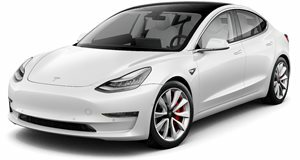 Before Tesla finally revealed the long-anticipated $35,000 base Model 3, it introduced a slightly more expensive Mid Range version to sit between the Long Range and the (then future) base car. The Mid Range Model 3 offered a 260-mile range, which was between the base car's 220-mile range and the Long Range's 310-mile range at a price of around $45,000. We say 'offered' in the past tense because Tesla has now discontinued the Mid Range Model 3 just a few months after introducing it. As we know, Tesla has made a habit out of shaking up its model lineup unexpectedly, so this change doesn't surprise us too much. As of this writing, it doesn't seem like Tesla has issued a statement on why the Mid Range Model 3 was discontinued and CEO Elon Musk has been uncharacteristically silent on the matter. If we had to guess, the Mid Range model's discontinuation was likely caused by two factors. The first is the introduction of the base Model 3. Opting for the Standard Range Plus model bumps the range from 220 miles to 240 miles, making the 260-mile range of the Mid Range model seem slightly unnecessary. The second is Tesla's pricing structure, which went up on all models except for the base Model 3. With the price of the Mid Range model set to increase, Tesla likely thought more people would opt for the cheaper Standard Range mode and decided to simplify the ordering process. Along with the Mid Range model's discontinuation, Tesla also announced it will be introducing a power increase for all Long Range models in its firmware version 2019.8.2. In the release notes for this over-the-air update, it says "Your vehicle’s peak power has been increased by approximately 5%, improving acceleration and performance.” With the update, the Model 3 Performance will now reach a top speed of 162 mph and owners should notice that their cars feel a bit more powerful.